St. Victor was a distinguished soldier of war who was both born of a noble family and had distinguished himself in bravery through many military campaigns. These are the acts of his heroic martyrdom where despite torture, imprisonment, and public ridicule the Romans where unable to get him to offer sacrifice to false gods even when they tried to force him under restraint to do so. 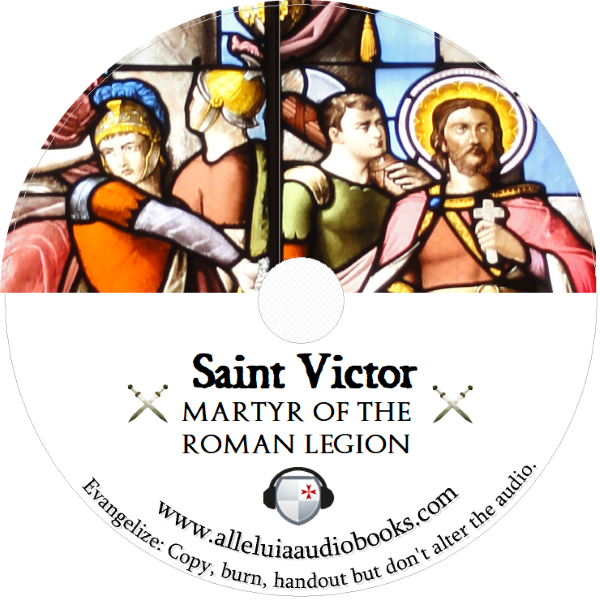 During his ordeal of being tortured and despised St. Victor said he would still would still eagerly embrace any lawful command that the emperor gave, but he steadfastly refused to do what was sinful. May all Christians always put God first , and when persecuted still choose to love those who persecute them and not fall prey to hatred and sedition. This Audiobook is an excerpt from the Acts of the Early Martyrs translated by J.A.M. Fastre SJ The First Series, published in 1871 and is in the public domain. The picture of St. Victor on the Disc is from this wikipedia commons with an attribution license.